Directly from the Bulgarian Rose Valley in Kazanlak. Offered by rose grower and distiller. Genuine steam-distilled Bulgarian Rose Essential Oil (Rose Otto) and Rose Water. Lowest rose oil and rose water prices. 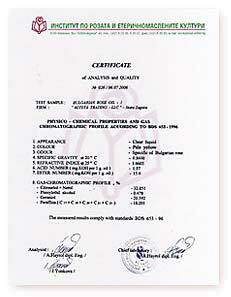 Quality certified by internationally recognized independent research lab. A rose grower, distiller and beauty maker, with our own organic and natural rose farms in the heart of the Bulgarian Rose Valley, Alteya specializes in the cultivation and harvesting of the Bulgarian Rose, steam-distilling our own Rose Oil (Otto), and offering it to our customers worldwide. Every year, our main focus is the production of the highest quality Bulgarian Rose Oil available on the world markets. 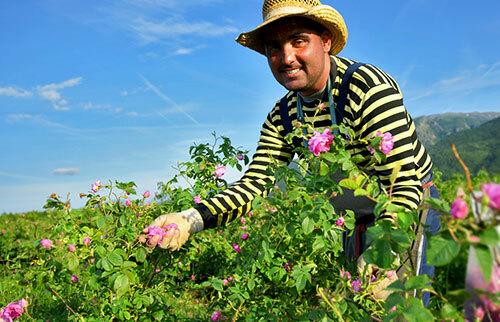 We employ well-known experts who monitor and manage the rose cultivation, harvesting, and rose oil production. 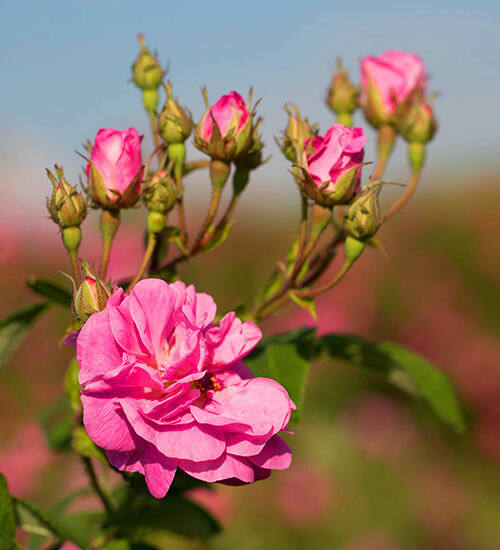 We work closely with the Government-appointed rose oil laboratories and institutions to ensure that our essential rose oil meets and exceeds all industry standards. We meticulously select our rose plants, handpick the rose blossoms, and distill essential oil that embodies the marriage of century-old traditions with modern technology. Our Bulgarian Rose oil is obtained through a special distillation method that preserves the biodynamic energy of the rose plant. Because of the unique climatic conditions and geologic settings in the area, our rose oil is considered of premium quality with a very rich, multilayered fragrance. Growing roses, producing Rose Otto, and making the purest skin care based on the Rose Otto, is our main business and as producers we are proud to offer an unsurpassed combination of industry’s best prices, top quality, and origin and purity guarantee available anywhere online. Larger Orders – please contact us. Bulgarian Rose Oil, or Rose Otto, is the essential oil extracted from the petals of one of the rarest flowers in the world, the Bulgarian Rose Damascena; which is only cultivated and harvested in the Rose Valley of Kazanlak (also known as the “Bulgarian Rose Valley”). Because of its amazing properties, multiple applications in skin care, medicine, aromatherapy, and fine perfumery, and extremely limited supply very year, pure genuine Bulgarian Rose Otto is considered one of the most precious essential oils in the world. Alteya’s Certified Organic or Natural Bulgarian Rose Water is 100% pure and natural product, obtained by steam distillation of fresh rose blossoms, hand picked from our rose fields during the annual rose harvest in the world-famous Bulgarian Rose Valley. It is pure, undiluted, therapeutic- and food-grade product and does not contain any preservatives, additives or chemicals. By using a unique distillation technique, which matches tradition and modern research, we distill a special grade rose water that completely preserves the biodynamic energy of the rose plant. Located in the center of Bulgaria, shielded between the Balkan Mountain Range and Sredna Gora mountains, the Bulgarian Rose Valley is the home of the Bulgarian Rose and a world center for Bulgarian Rose Otto production. There are over 7000 varieties of roses worldwide, yet only few are known as oil-producing. The Rosa Damascena, cultivated in the Bulgarian Rose Valley for over 300 years, is considered the best oil-bearing rose renowned worldwide. Unique climatic and soil conditions make the Rose Valley the perfect home for rose growing and rose oil production. The mountain rains and fresh air create the perfect environment for the plentiful pure botanicals that grow in the Valley. Mild winters prepare the rose plants for the blossoming season. The air humidity, cloudiness and precipitation in May and June contribute to the cultivation of roses that yield very high percentage of oil. The Rose Valley has also always been the center stage for the colorful age-old Festival of Roses. This traditional festival is a symbol of the rose industry and its influence on the culture, spirit and lifestyle of the Kazanlak Region. The rose festival is celebrated with folk songs and dances at Kazanlak and Karlovo on the first Sunday in June, at the start of the rose harvest in the Valley. The Bulgarian Rose Valley is also the home of Alteya’s rose plantations. Bulgarian Rose Oil (Rose Otto) is produced through Steam Distillation of fresh rose flowers. Our rose oil is a 100% pure and natural product that is used in creams, lotions, soaps, and perfumes for its mild anti-viral and bactericidal properties, as well as for its fragrance. The water, left from the distillation of rose oil, is never used again, which is a key difference from many other companies who save costs by reusing the by-product of rose oil and market it as rose water. Alteya runs a separate distillation cycle to produce the famous Alteya rose flower water (aka Rose Water) beneficial for cleansing and refreshing dry, sensitive skin. 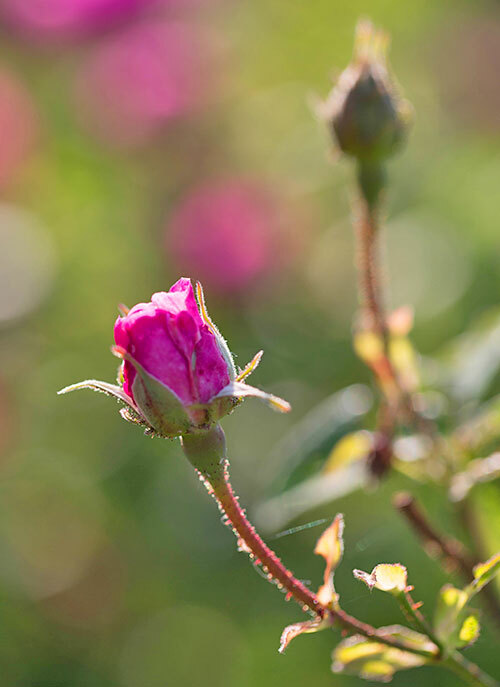 Besides being used as a medicine in history, the rose oil has a long history as one of the most important ingredients in most luxury skin care products and is often referred to as “liquid gold”. Bulgarian Rose Absolute is produced through a refined, liquid solvent extraction of fragrant compounds from fresh rose flowers. Although the rose absolute contains essential oil compounds it differs from distilled essential oils. The rose absolute oil is a concentration of aromatic compounds including essential oil constituents. 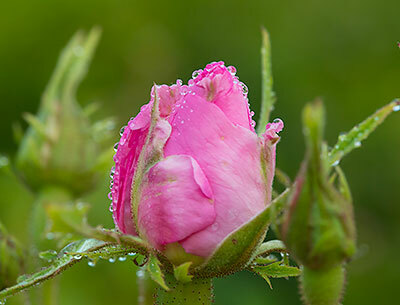 Rose absolute is widely used in perfumery, cosmetics, aromatherapy and many other areas. Rose Otto has more concentrated rose-honey like notes comparing with rose absolute where the fresh-green scent is dominated. Alteya is proud to offer both Bulgarian Rose Oil and Bulgarian Rose Absolute directly from our rose fields in the Bulgarian Rose Valley. Our Bulgarian Rose Concrete is obtained by cold extractions of fresh rose blossoms of the Bulgarian oil-yielding rose (Rosa Damascena) with an organic solvent like hexane. Around 350kg of flowers are needed to produce 1kg of rose concrete, which explains why our Rose Concrete is less expensive than our Rose Oil. The Bulgarian Rose Concrete is considered the highest quality Rose Concrete in the world. It is a waxy semi solid material which has multiple uses in perfumery and cosmetics and is one of the most popular solid perfumes worldwide. Now through Sunday, we are offering an exclusive 30% off promotion on our Certified Organic Bulgarian Rose Beauty Capsules and Drops and our Organic White Rose Water Spray 250mL! Lavender is one of the most widely used essential oil bearing plants. 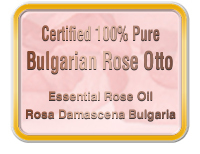 The Bulgarian Rose Otto is a pure essential oil a highly-concentrated rose plant essence. It should be used carefully during pregnancy and should be kept away from children. Contact with eyes should be avoided. It is recommended to apply Bulgarian Rose Oil directly on the skin only after check with small amounts for any alergic reactions. Please familiarize with this product before use. “…I mix the rose oil with sandalwood and jasmine during massages. Since its founding, our company Alteya has been working hard to provide employment and support to the local population in some of the poorest villages in the Rose Valley and the Balkan Mountain regions in Bulgaria. By purchasing our products, you give a chance for economic survival to more than 300 families who are otherwise struggling to provide for themselves and the ones they love. Our employees are our extended family – like us, they love the Roses, The Valley, and our Nature. Thank you on their behalf.